Over and over again we read in the scriptures that Jesus brings life. He gives life, He sustains life, and He keeps life going eternally. What Jesus has brought, no man should take away, wound, or destroy. I had been doing volunteer work at the local animal shelter, cleaning cat cages. I noticed a rather forlorn looking cat. I felt sorry for him, and decided to adopt him. I named him Mr. Smokey Sweet. With the adoption came a free vet check. The vet happened to be the one I had been going to for years anyway, quite close to me. I learned that Mr. Smokey Sweet had an upper respiratory infection. So, of course I asked the vet to treat him for it, which cost around one hundred dollars, with antibiotics. I did everything I could possibly do to help Smoky. Someone at the vet clinic loaned me a steamer. I put the steamer under my piano bench, draped a sheet over it, and put the cat inside. Sometimes I would pick Smokey up and dance with him, trying to give him more love and attention – some joy in his poor, sick life. Well, Smokey did not rally, and did finally pass away. We mourned him and had a Christian burial for him, as we do any animal who passes on here. I learned some things from my whole experience with Mr. Smokey Sweet. I was told at the vet clinic that many dogs and cats become sick at the shelters. Seems odd, in that the shelter had hand sanitizers at every doorway, and everyone was told to use them. Probably what is needed is a new facility, modeled after those where animals can be isolated for several weeks before being put in with others, to control for contagion. I was really disgusted by the policies of my city when over a million dollars was spent for an unnecessary, and, to me, rather ugly downtown fountain, while the antiquated animal shelter is allowed to go on making precious dogs and cats sick year after year after year. Also, a bill to modernize and enlarge another local shelter, badly needed, was more recently voted down. I thought about how unfair contaminated shelters are to innocent, well-meaning families, who adopt a dog or cat from the infectious shelters, only to find later the animal is sick and in need of expensive vet services, and may live, or may die anyway, as did Mr. Smokey Sweet. I can imagine little kids crying their hcarts out when their precious new kitty or doggie dies. Also, many families can’t afford possibly hundreds of dollars of vet bills to try to save a sick dog or cat they then have come to really love. Of course, the greatest victims are the dogs and cats, who, like Mr. Smokey Sweet, have been given life by Jesus only to have the practices of humans cause them to lose their lives unnecessarily and far too soon, at least on this earth. That’s not fair. That’s not what Jesus wants. How extremely miserable it must be for any dog or cat to die of upper respiratory infection or anything else. Jesus gives us life, and he gives the precious animals life. It is NOT OK for us to set up or allow conditions to exist which jeopardize anyone’s life or well-being. We are to safeguard lives and to protect them as much as humanly possible. Safe, sanitary animal shelters should be of primary importance, not somewhere at the bottom of the priority ladder. 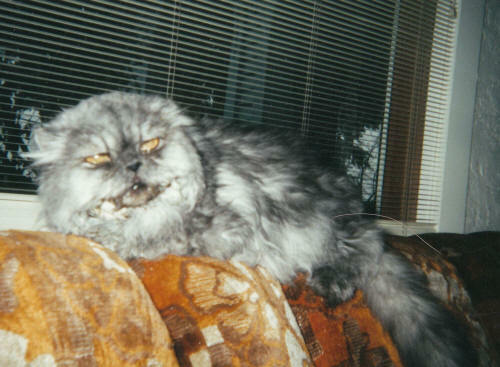 I pray that Mr. Smokey Sweet has been in Heaven for several earthly years now, and that he is gloriously happy. I want to see him again, God willing!! To me, God’s giving humans dominion over the earth and the animals means we are to reverence life, to take care of our own lives responsibly, and to help the animals’ lives as much as we possibly can.